Who Is John C. Hitt? Meet The Man Behind The UCF Evolution. If you’re looking for a traditional profile of a president, this isn’t it. 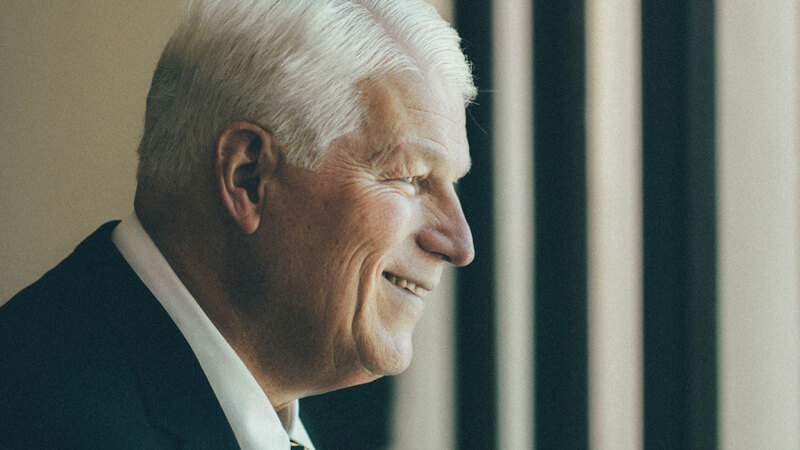 Chances are that if you’ve lived in Central Florida at any point during the past 26 years, you’ve heard about President John Hitt and what he’s done to transform UCF and the region. In preparation for this article, I read and watched nearly two dozen features about Hitt. In almost all of them, he speaks at length about the people of UCF and what we’ve all achieved together. He talks about the accomplishments he’s most proud of, how many students are enrolled here (now more than 66,000) and what they go on to achieve. What I found less of is the man behind the curtain. He’s naturally private, perhaps the result of years of knowing it’s more important to talk about UCF than his life, knowing it makes it easier to accomplish what he wants. And, with the help of many people, he’s been able to achieve some pretty difficult things, many of which naysayers said UCF would never be able to. During five interviews over the course of as many days in late March and early April, Hitt talked a good deal about UCF. He’s retiring from the presidency on June 30, and naturally he’s taking stock of the 26 years he’s spent leading the university’s growth. But in his office on the third floor of Millican Hall, he also opened up. You could say to know someone, you need to know who they’ve been. To know Hitt, you’d have to go back to Houston in 1940 — the year he was born. On his first birthday, the Japanese dropped bombs on Pearl Harbor and changed the course of the United States’ involvement in the war. As a result, while Hitt was still just a small child, his father and uncle made a pact that whoever wasn’t drafted would take care of the other’s family. Hitt’s father, a typographer and printer by trade, was the one who stayed behind. 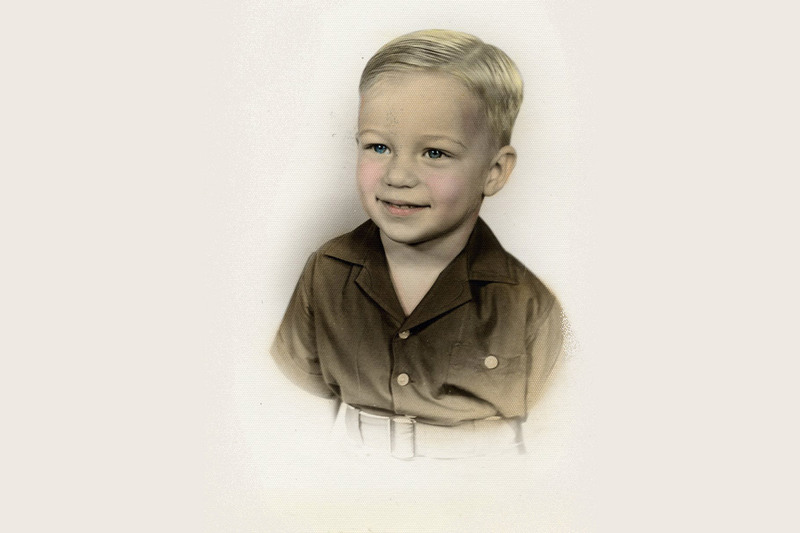 For several years, young John Charles grew up in a nice house with his cousin, Bill (who was only a month and two days younger than Hitt), his aunt and his parents. 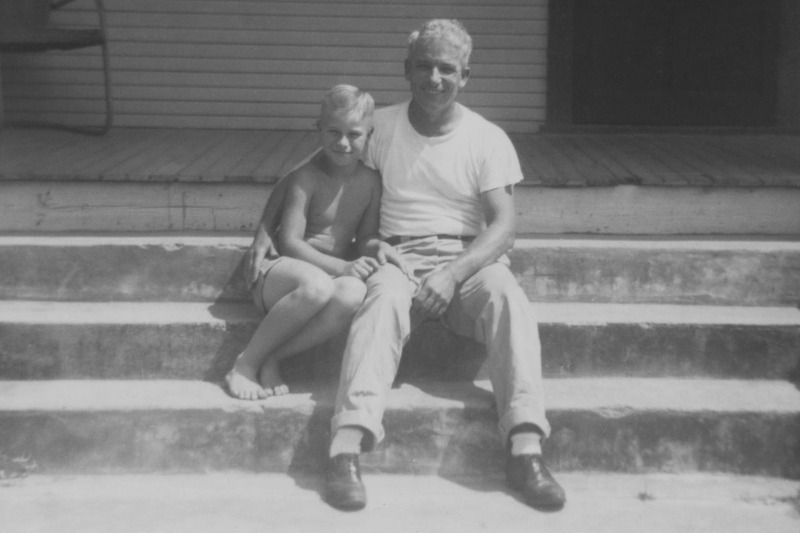 When his uncle returned, Hitt and his parents moved into a house of their own, a house that wasn’t as nice or as big as that house with Bill, but it was a good house in a decent part of town. In Texas in the 1950s, the legal driving age was 14. “Not the most sensible, if you think about being 14 and driving,” Hitt says. But still, only a year later, he would become the man of the household when his father died of a heart attack, leaving him and his mother behind. As a bindery worker, she met her husband because they were both in the same business: printing. And in the 1950s, when it was less common for women to have professions, she not only worked in but also ran the family business. Hitt grew up working in that shop. Before he passed away, his father had Hitt work weekends. He may have been the owners’ son, but he didn’t get all the glory work. On Saturdays, for example, it was Hitt’s responsibility to melt the used linotype — lines of words in single strips of metal — in a big, old iron pot, and pour it into 25-pound ingots. What he never thought of becoming while growing up — what he had no concept of even being a profession — was a university president. The idea of college was foreign to Hitt. His mother had finished high school but had never gone to college. And his father didn’t have the choice to go, as he had to drop out of high school and work to pay for his mother’s medical bills when she became ill. But Hitt’s mom would push him to go to college because it was his father’s dream, and dreams are worth pursuing. 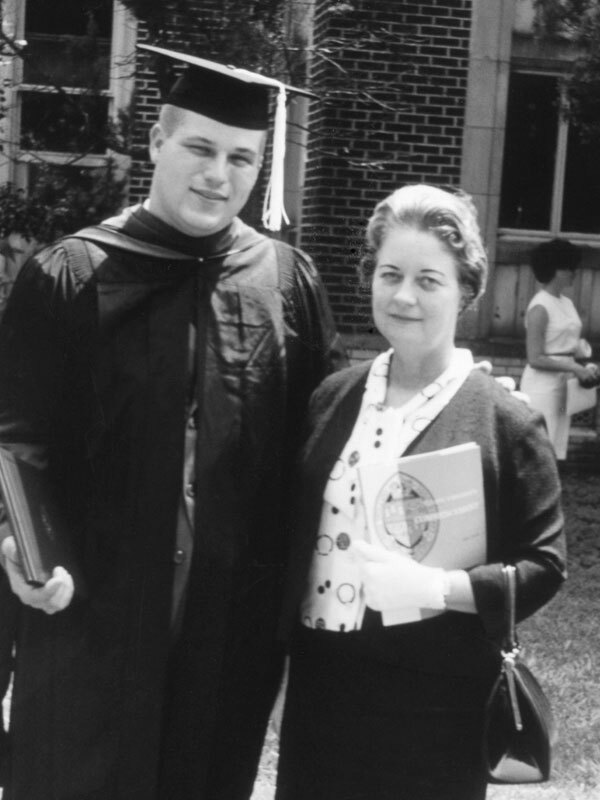 And so in 1958, Hitt enrolled in Austin College, a small, private liberal arts college, more than 300 miles away from his home and his mother and everyone he knew in Houston. There, he played football, met the professor who would change the trajectory of his career and fell in love with the woman who would become his wife. Growing up, Hitt was a big kid, which in Texas meant not only that you played football but also that you played tackle. When asked to describe how he was as a player, he replies, “One word: mediocre.” But there was that one great game. His team was trailing, and he had gotten so annoyed with the opposing player who kept holding him that he ran right through him and tackled the quarterback, forcing a fumble. Hitt’s teammate recovered the ball, and the Austin College Kangaroos won the game. When Hitt started at Austin College, he didn’t know what he wanted to study, but one semester he needed a course, so he signed up for a psychology class because he’d heard the professor was a good lecturer. It was a big class for the small school — maybe 40 to 50 students, by Hitt’s estimate. That professor would impact Hitt’s life in ways he hadn’t expected. Suddenly, Hitt knew what he wanted. He wanted to be like Angermeier, the man who gave him the opportunity to work in his lab and assist him on research projects. 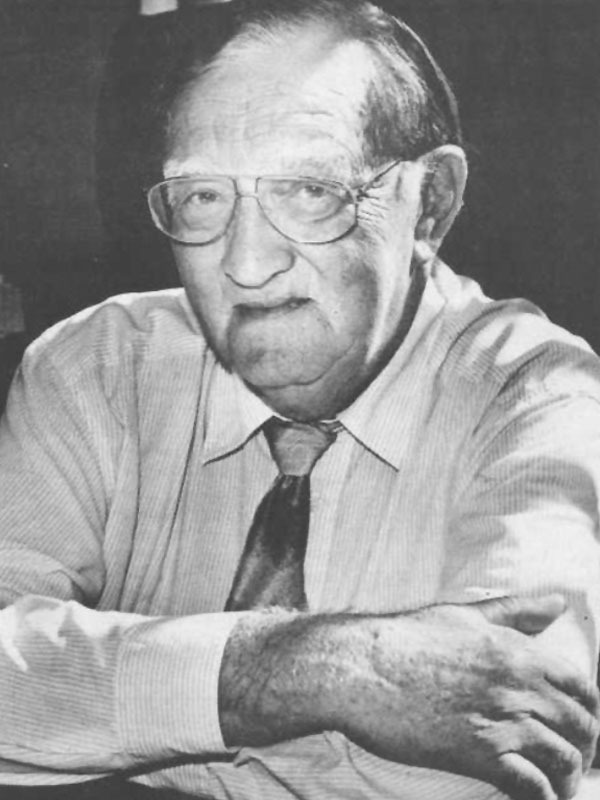 Angermeier became his mentor, encouraging Hitt to pursue a master’s and doctorate in physiological psychology. He was also Hitt’s best man at his wedding and a lifelong friend. The first time they saw each other, Hitt had gone to Martha’s dorm to pick up a date. Martha was by the desk where students had to check in and out. Back then, such things were required for female co-eds. “I looked at him and said, ‘Oh, he’s tall. He’s good-looking. He has beautiful blue eyes. Too bad he’s so young,’ ” she says. Eventually, they ended up in a small speech class together. They got to know each other and dated for months before breaking up, as young couples often do. They were alike in so many ways — both were only children — but also so different. The split was good for them. It made them realize there was something about the relationship that was worth pursuing. Within six months of breaking up, they were engaged. They’ve now been married for 56 years and have two children and two grandsons. “She’s been a wonderful, wonderful life partner,” Hitt says. 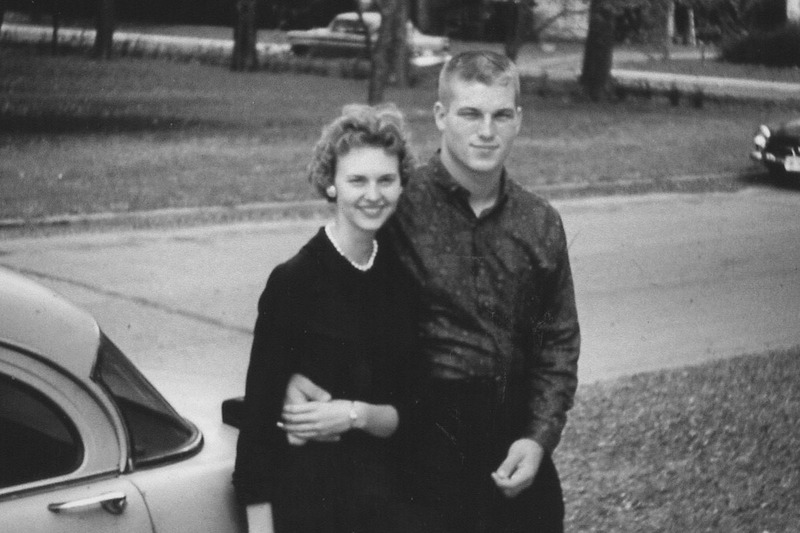 Martha Halsted and John Hitt were married on December 23, 1961. In my interviews with Hitt, two subjects make him emotional: Martha and UCF. He can’t imagine a life without her, an eventuality he’d rather not think about. And while he’s looking forward to being able to spend more time with his wife and their family, he’s also wistful about separating from a place he’s shepherded for more than a quarter of a century. Hitt’s health and age played a role in why he decided to step down now. At 77, he’s still sharp mentally, never missing the opportunity to inject his signature wit, but he did have a heart attack a few years back. He’s made a full recovery, but he, naturally, worries about his health. He also stepped down because “it was the right thing to do.” The decision was not an easy one, but it was the one UCF needed. At the time, the university was in a position to potentially lose its provost, Dale Whittaker, who, after a nationwide search earlier this spring, will become UCF’s fifth president on July 1. “I’d had a realization that was grounded in Dale’s looking at the Iowa State presidency,” he says, twisting the gold Pegasus ring on his right hand. “I’m always trying to game in my mind how things will play out, and it seemed very unlikely that I could hire the kind of person we would want to replace him if I couldn’t say that I would be here three to five more years. And I just knew I couldn’t do that. Hitt has certainly received criticism for decisions made during his tenure, including ones he wasn’t involved in. Universities by trade are full of smart people trained to be critical thinkers, and anyone in a position of leadership, especially for more than two decades, will undoubtedly upset some people along the way. He admits he’s had to make difficult decisions, especially concerning budgets, which can impact not only people’s programs but also their livelihoods. But he always tried to base those decisions on what was best for UCF. 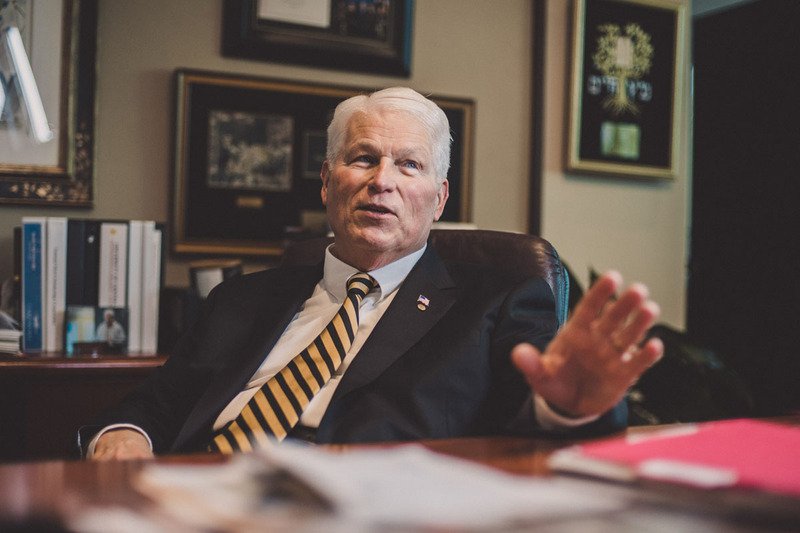 “As a university president, you’ve got to be known as someone who is trustworthy and reliable, and you have to have a sense of what really matters,” Hitt says. 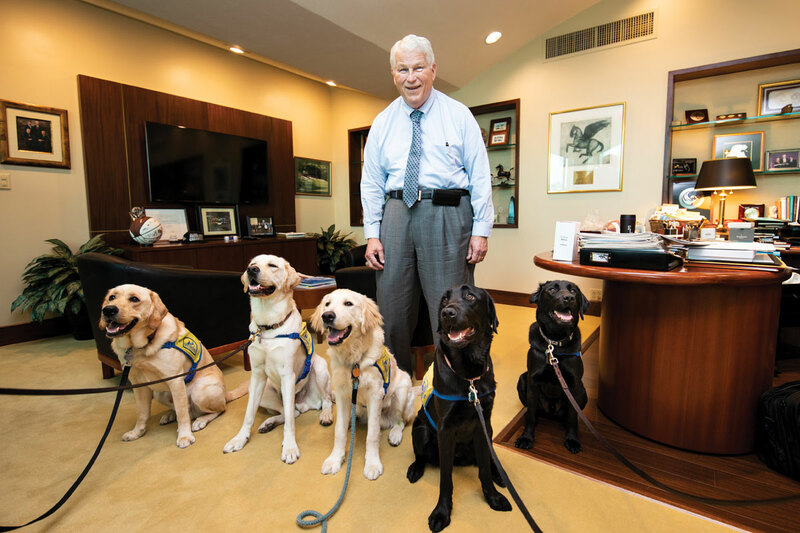 In April, dogs in the Canine Companions program stopped by Hitt’s office. During our interviews, Hitt reminisces about what it means to be a leader and how who we are impacts what we do. We don’t talk about it much in these interviews, but Hitt is someone who believes in America. He believes in its promise and potential. It’s a level of patriotism perhaps associated with a certain generation, but every day, Hitt places an American flag pin on his left lapel, just above a UCF pin, right above his heart. He’s a man of faith. Both he and Martha are Episcopalians, and they’re eager to find a church in their new home of Madison, Wisconsin. He’s a self-described old-school Democrat and a Rachel Maddow-watching news junkie. He gets as excited about new technology as anyone you’ll meet. His new home has two wireless sound systems, and he wears an Apple watch on his wrist and an iPhone in a holster on his hip. Every few seconds, they buzz with the notification of new emails and messages and events. And he’s 100 percent a dog person, admitting he knows he shouldn’t let London, a golden retriever-yellow lab mix, sleep in bed with him and Martha. But he does. I tell you these things because they’re who Hitt is, but also to say this: In a nation that is deeply divided on many topics, Hitt sees these differences as a reason to work together. “We have an unusual situation here [at UCF], where people are much more likely to want to work together to solve a problem than they are to point fingers and want to fight,” he says. “I’ve had the good fortune to discover that early on. That’s not to say that we always have harmony on everything. 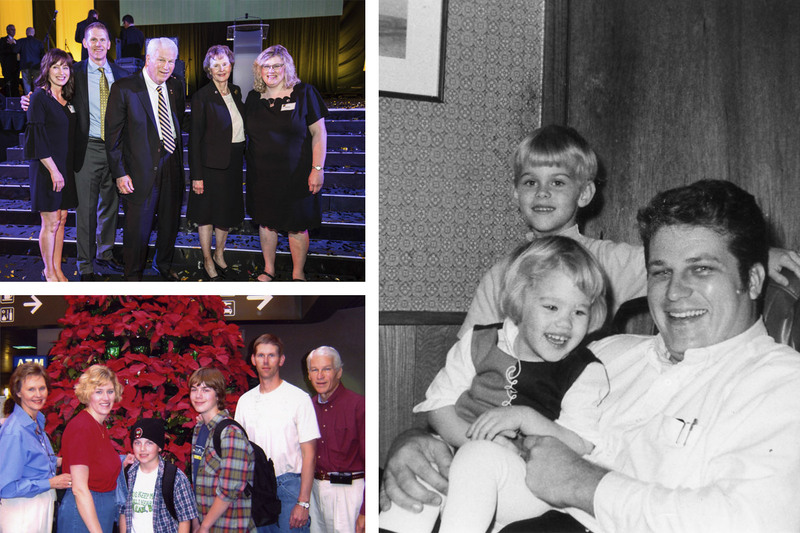 Clockwise from top left: John and Martha Hitt (center) visited with their daughter-in-law Julie, son Charles and daughter Sharon during a gala in May honoring Hitt’s legacy at UCF; Hitt with his daughter and son when they were younger; the Hitts with their daughter, son and grandsons in 2003. As we sit in his office, you can hear the beeps and rumblings of heavy equipment and the shouts of a construction crew. The Reflecting Pond — which you can see from the panoramic window in his office that looks out onto the John C. Hitt Library and horseshoe-shaped lawn — is being renovated. After being drained in October, the pond is being rebuilt. The concrete base was demolished, removed and resurfaced. The fountain got new plumbing and filtration, upgraded lighting and a more efficient plumbing structure. 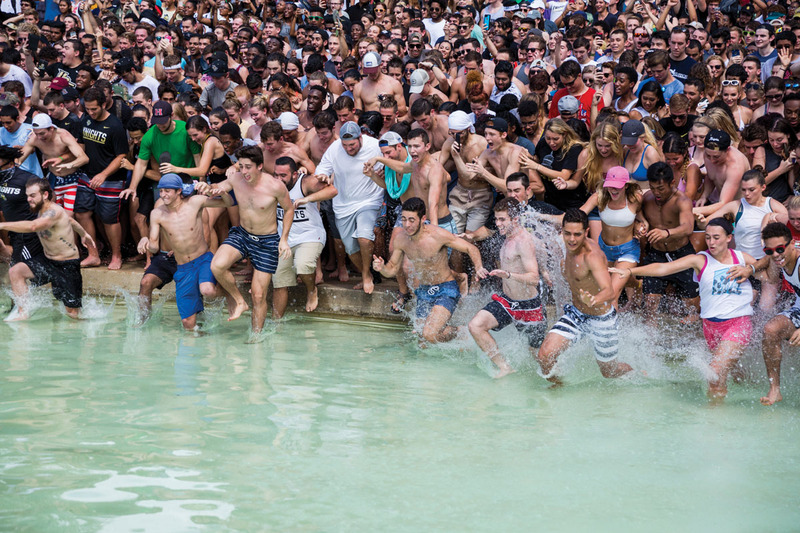 When more than 5,000 students and alumni charge into its aquamarine waters this fall during Spirit Splash, it’ll be ready. Admittedly, when Hitt became president of UCF in 1992, he didn’t realize how sentimental he’d become about a water feature. Then, the Reflecting Pond had only a single spigot, a far cry from today’s display. But as much as the main campus has changed since he started, his view of the Reflecting Pond has remained a constant. Sure, the construction can be seen as one more way of reinforcing the common campus refrain that UCF stands for “Under Construction Forever.” But, for many, it speaks to something that seems as inherent to UCF as it does to the city we call home: change, growth, evolution. Some universities have been around for centuries. This fall, UCF will celebrate the 50th anniversary of the first classes held on campus. And for half of our history, Hitt has been leading — and encouraging — that reinvention.